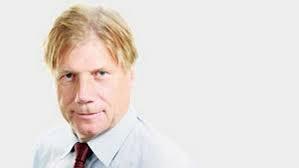 Lawrence Martin is a journalist and the author of books on both politics and sport. More importantly, he is the author of the best hockey book that’s out of print. 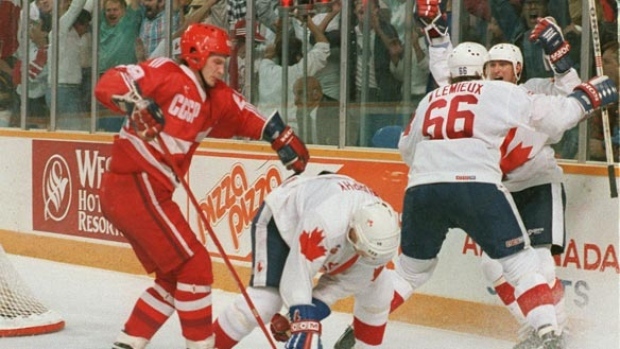 It’s called The Red Machine, on the history of the Soviet hockey program, which dominated international competition before the NHL’s best joined the fray—after which the Soviets challenged Canada for world hockey supremacy. The legacy of the Soviet system lives on today: the game as played around the world is indelibly marked by the strategies and techniques developed in the Soviet Union during the Cold War. That legacy is proudly on display in The Red Army, a documentary focused on the later stages of the Soviet regime, and in particular Slava Fetisov’s story therein. The Red Army does a lot of things well, but the thing that stuck out to me was the game tape, and how recognizable the Soviet players’ moves are. They were playing the style now played by the best in the NHL—and not just Datsyuk, Malkin and Ovechkin, but also Crosby, the Sedins, Kane, and many more. Not that Canada’s influence has gone anywhere, but you have to respect what the those teams created in 1970s. They were truly ahead of their time. The film features an interview with Lawrence Martin. And like his The Red Machine, a source text for the film, The Red Army has garnered a surprisingly small audience. In Toronto, a hockey city for sure, the film played only sporadically and in small, off the radar theatres, after it debuted at the Toronto International Film Festival and received very positive reviews from critics and audiences alike. But unlike The Red Machine, it is at least available (from itunes). It’s well worth a watch. Fetisov is fascinating. As loyal as he is revolutionary. He’s like Tarasov, maybe. But that’s a consideration for another day. For now, below are excerpts—edited for clarity—of a conversation I had over the phone with Lawrence Martin. 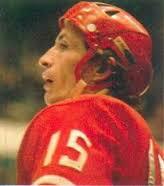 ~ E Martin Nolan: You are the author of The Red Machine, one of the best hockey books I’ve read. It’s out of print. You were working as [Globe and Mail] Bureau Chief in Moscow when you wrote that, correct? Lawrence Martin: I didn’t do the actual writing there. It was based on my hockey experiences over there, and research I conducted back home in Canada. EMN: Were you just a casual fan then, when you were over there? LM: I opened the Moscow bureau for the Globe and Mail in 1985, and I was there for three years. There was a great deal of interest in Soviet hockey. They’d been doing very well against us in international tournaments through the end of the 70s and into the 80s. This was a wonderful opportunity because there was nobody there from the Canadian press or media who was covering hockey, and I could get a close look. I started going to Luzhniki, to the regular season games in the Soviet league. I got to know some of the hockey people there, like [Anatoli] Tarasov. I interviewed him once. [Viktor] Tikhonov was the coach then. And of course they had the big five, in their prime: [Vladimir] Krutov, [Igor] Larionov, [Sergei] Makarov, [Slava] Fetisov and [Alexei] Kasatonov. Having to write “Krutov, Larionov and Makarov” out all the time, I just started calling them the KLM line, and a lot of people in Canada started picking up on that. When I got back to Canada in ‘89/90, I thought I should do a book on the history of Russian hockey. That’s how The Red Machine came about. I got a lot of the old Russian hockey books, and I knew enough Russian to understand them. The book’s a little more popular now, because we just had the movie out, The Red Army. The movie’s less about the whole history, and more focused on Fetisov. EMN: I’ve not been able to see Red Army yet. It only played briefly in Toronto. That’s surprising to me. I’m also surprised the The Red Machine went out of print, given how interesting the story is. Am I right in guessing that it has something to do with the timing? The Berlin Wall fell between your writing of the book, and when it was published. So in your book, the Wall hasn’t fallen yet, but when it was published, it had fell. LM: Yes. The book was received very well by reviewers. We didn’t put many copies in print and it didn’t capture a big audience back then. Not sure why. I’ve written ten books, some have sold well, some haven’t. EMN: I would imagine Canadians would be more interested. The Summit Series books do well. The Game did very well, and Dryden writes about the Soviet game there. It’s surprising that the book didn’t catch on. LM: The other thing is that it depends on what the publisher wants to put into the promotion of the book. They didn’t have a big advertising budget for The Red Machine. EMN: I can see that. Moving on, what was Tarasov like? LM: He was really, really torpulent, and not in great health. He hobbled around and was very blunt-spoken. He was impatient with the quality of my Russian. He would correct me when I made mistakes. He was very direct in his commentary on Russian hockey. He was a fascinating character, because he brought some imagination to the game of hockey. The five-man unit, the tic-tac-toe passing, he was an early advocate of conditioning and training. On of his sayings was that the puck carrier is the servant of the other players. But maybe they took passing too far. I think we [Canadians] picked that up from them. Watching hockey now I sometimes feel there’s not enough individual play. Players are all-too-ready to pass the puck when there’s a chance to go around a guy and get to the goal. EMN: I interviewed Marcel Dionne a few years back and he said the same thing. LM: Oh Yeah? Dionne was a great individual skater and player. He could weave and move with the best of them. EMN: Do you think the game is what it is now because of the Russian style of play? LM: That’s a complicated question. I think there was a melding of the two styles. We had our players in the Russian mould, like Wayne Gretzky. Tikhonov called him the ideal hockey player, and said that Gretzky would have fit perfectly into his team. Gretzky was incredible. It’s quite extraordinary now, of course, with the fall off in scoring in the NHL. It’s astounding. [Mario] Lemieux scored 199 points one season, Gretzky scored over 200 four or five seasons. Today we have hardly anyone who can score 100 points. The quality of the goaltending is one reason, but there has to be others. EMN: Could it be that the game caught up to guys like Gretzky? He was explicitly using Russian techniques. His father put him through Russian drills, and was reading Tarasov’s work. LM: In the backyard in Brantford. He did unusual drills. He was great at receiving the puck, using his feet and the dipsi-doodling manoeuvres we saw from the Russian greats, particularly [Valeri] Kharlamov. EMN: I wonder if it’s almost like Gretzky found an efficiency in the game that he could exploit, because no one else was playing the way he was. LM: Well, there’s so many other factors. I think there’s more emphasis on forechecking in modern hockey. In the old days, Bobby Hull used to wind up in his own end and head over centre ice and the other side would be waiting for him. [Players] were free to wheel in their own zone. In fact, it was Tikhonov who started using four lines, back in the mid-to-late Seventies. You wouldn’t find a lot of teams in the NHL doing that. 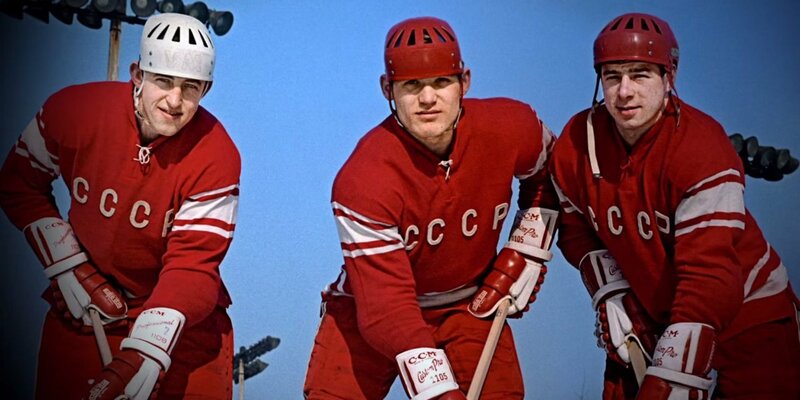 Tikhonov was an innovator, even though he was a Stalinist autocrat who alienated an entire team in the end. But he did have smarts enough to do that, and play those extremely short shifts—45 seconds. They probably overdo that in hockey today. In the old NHL, good players used to be out for a minute and a half, which would lead to more scoring for them too. We have defenseman today who play half the game, but forwards: you’re out there for half a minute and you hardly touch the puck before you have to go back to the bench. It’s a different game because of the [use of] four lines. EMN: Wasn’t it the Flyers’ coach, “The Fog,” who also used a lot of Russian techniques as well? LM: I interviewed Freddie “The Fog” Shero for [The Red Machine], and covered him and his “Broad Street Bullies” when I was a hockey reporter for The Globe and Mail in the Seventies. He didn’t get the credit he deserved for being an innovator. He was one of the few Canadians who actually went over to the Soviet Union, to hockey camps, and studied the way they played. When he wasn’t drinking vodka, which he liked to consume, he learned quite a bit. He really implicated the Flyers’—aside from their ridiculous roughhouse tactics—into a system of short passes and five-man units, which Shero would use a lot. They were a terrific passing team, and Shero was an excellent coach, from that point of view. EMN: What was Tikhonov like, personally? LM: He was miserable. He didn’t like to be interviewed, he didn’t like to talk to anybody. He ran the soviet hockey camp like—he believed that for anyone to be excellent at hockey he had to live drink and eat hockey 365 days a year. He wouldn’t let the players out of his training camp. He isolated them. They only had one phone. They had to line up to phone their families; they were only allowed to do that every few days. They had about one day a month where they could get out of there. Finally, when Gorbachev started opening up the Soviet Union, Soviet players began to rebel because they saw how senseless this system was. The conditioning, the training, the practices every day: They helped the soviets in some way, but in the end they went overboard and the players rebelled and wanted to move west. It was largely Tikhonov’s fault. He was totally inflexible, and ran an autocratic system. He came up in the Stalinist period of the Soviet Union, when everything was regimented from above and was a collective society where no one had individual freedom. EMN: Reading The Red Machine, I got the impression that he created a microcosm that was small enough to be controlled and where he could put a Stalinist ideal society in place within this small window. LM: That’s right; he built his own little Stalinist hockey society, at a camp just outside of Moscow. It was a beautiful spot, in a way. You entered into a tall-birch-tree-lined street and it was a nice village. But it didn’t even have a hockey rink. They had to take this broken-down bus a few miles every day to practice. They had it out there because they figured the air was fresher. But yes, he operated like a tyrant. There’s no other word for it. When you take away that much freedom, a young guy like [Alexander] Mogilny—who I followed as a Russian Junior—he just thought it was absurd, and he was one of the first, of course, to desert. EMN: Whereas Larionov, Fetisov, etc., were sanctioned to leave, and the Soviets took most of their payment. Fedorov and Mogilny left. LM: Mogilny was a terrific talent. But you have to credit guys like Larionov and Fetisov, who were the first to be brave enough to speak out. Krutov didn’t translate to the style of play over here. But those two, with Makarov–who had those elastic legs, like Guy Perrault–they were magical to watch. EMN: Was there tension between Tarasov and Tikhonov? LM: Tarasov was old and in the background by then (the mid-80’s). He was viewed as an old patriarch. He had his differences with Tikhonov, but he didn’t air them too loudly. EMN: He had been pushed into the background. LM: He challenged authority; he was a rebel. There was a great internal debate going into the 72’ Summit Series, about the coaching, and the system they would use. Tarasov got on the wrong side of that argument. 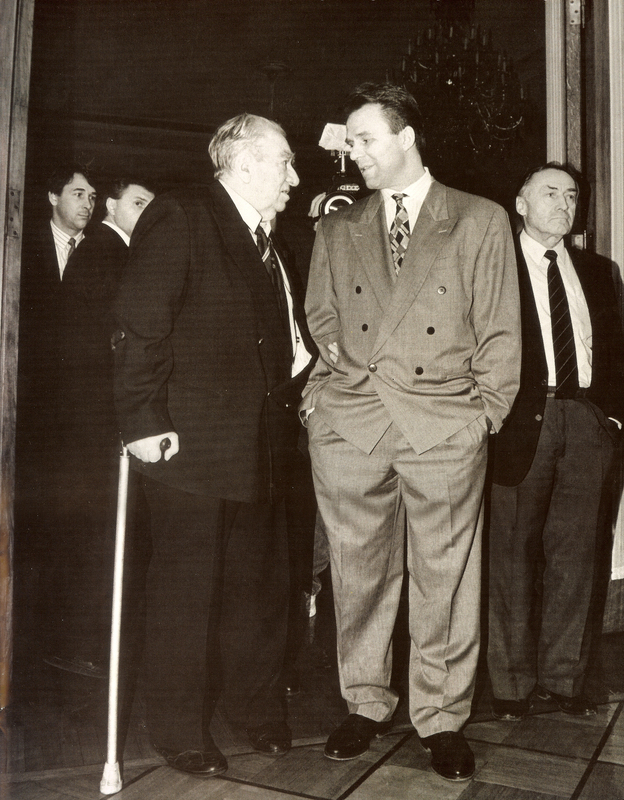 Once, when the [Soviet leader] Leonid Brezhnev was in the audience, in a dispute with officiating Tarasov pulled his team off the ice. They were not going to return, but Brezhnev sent down orders to get his team back on the ice. Tarasov did not ingratiate himself with the hierarchy. EMN: Another great player and later coach was Vsevolod Bobrov. Another individualist in a communal system. LM: He was injured in the 50’s, but was one of the greatest Russian scorers. He had a very individual, Gretzky-like style as well. He coached some of the big teams. But, there was a lot of questioning of his coaching techniques, and he got in a conflict with Tarasov as well. EMN: He was more open, an anti-Tikhonov. Which is interesting—the game of hockey can find a way of producing, providing, again, a microcosm, of a way to be an individual [in an environment that militates against that]. LM: We shouldn’t view the Russians as monolithic in their ways. 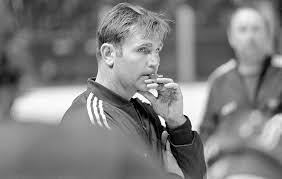 Although they did have a lot of people like Tikhonov, they did give individual freedom, on the ice, to their players. It wasn’t like all the soviet coaches were trying to hem their players in. They had a circular-weaving style of play. A very intricate, collectivist style of hockey that flowed from their political philosophy, of course. But they let individual stars have some freedom within that. That gets to a key point, I think. It’s one of the reasons Canada could beat them in the major competitions. We’re still pretty even. It’s hard to say who, in the 70s, 80s and 90s, came out on top. But when you view the difference—like in the ‘87 series, or in ‘80 when the Americans beat the Soviets—Canadians played with more emotion, more intensity. The Russians were part of a collective; they weren’t supposed to show much emotion. Tarasov was a big believer in an even-keeled mentality. He didn’t want anybody fighting, losing their temper, getting out of character. This hurt them in the end because they were pretty much a soulless unit. If you compared a great centreman like Phil Esposito to Alexander Yakushev, they were similar players in terms of their skill, but Esposito played on so much emotion and Yakushev didn’t have any of it. He admitted in an interview that that was a difference. He said there’s something that’s missing in Europeans in general, and Soviet players in particular, and it’s called “fight for the end.” It’s a special trait of Canadian hockey, he said. It’s the whole thing of the Soviets as “ice robots,” which is what Fetisov called them at one point. In the final stages of the hockey game, the Canadian intensity just took over. In terms of individual skills, I always thought the Russians were superior. They had superior skating. We had our Paul Coffey’s, but the Russians, still today, are fantastic skaters. They received the puck really well, worked with their feet better. But in emotional intensity, Canada had a big edge. Not so much, though, in the last decade or two. The Russians have been over here and they’ve caught up to the way we play. EMN: It seems there was a double edged sword to the scientific way that Tarasov thought about hockey. It gave him this effective, objective system, which was also detached and unemotional. ~ Let’s move on the book you’re working on right now. LM: I’m working on a book for Canada’s 150th birthday, on the history of sport in Canada. It’s interesting to look back and analyze the role that sport has played in the development of Canadian society and Canadian unity, social cohesion. In terms of the allegiance of people in this country to this country, sport has played an enormous role. I want to go through a lot of the great stories and heroes, but I want to take it further than that and look at what sport has really meant to this country. It’s meant a helluva a lot. EMN: Do you have a thesis, or central argument, about what exactly it has meant? LM: That’s what I’m still exploring. I’m in the early stages of research now, so I don’t want to jump to any conclusions. EMN: Looking at your bibliography, you write about 30 percent on sport, and 70 percent on politics and history. I find it interesting. Steve Paikin also wrote a hockey book a few years back. Do you see writing about hockey as a respite from writing about politics. LM: In a way, yes. I started as a sports reporter with the Hamilton Spectator, and then with The Globe and Mail in the 1970s. So sports has always been in my blood. I’m a fanatic in terms of the game of golf. Politics is where I’ve spent most of my career time. EMN: Does his love of hockey reveal anything about Stephen Harper? LM: He’s a genuine hockey fan. He appreciates the game. He likes to promote hockey as a politician because it gives him, with the people of Canada, another dimension they can identify with. He’s got a good knowledge of the game. He’s written a book on it, and it’s genuine. EMN: At what point does hockey become a myth to bind a country together, and at what point does it become a tool for propaganda? I’m thinking of Don Cherry. LM: If you go through unifying features of Canadian society, and the identifying features, you have to put hockey close to the top. It is basically our game. One can argue whether we actually played it first—there’s a lot of different theories on that [Martin himself describes how Bandy became hockey in Russia, in the The Red Machine]—but we developed the game faster than others, and it is our sport. It’s a winter sport and we’re a winter country. There’s a real visceral identification with the game. The tradition is so rich. The ‘72 Summit Series is one of the great iconic moments, and always will be. That is not overstated. I think, though, that our society is changing a lot and if you look at the immigrant population, we’re bringing a lot of people to this country that don’t identify with the game. It’s not a part of their culture. If that hockey identity is going to be sustained is a good question. There are [also] fewer youth playing hockey because there are so many other diversions nowadays. When I grew up, you played football and hockey. That’s what there was. Now, there’s other entertainment, and hockey’s become more expensive. Percentage-wise, compared to the old days, we’re losing a lot of our hockey population. That’s something we’ll have to watch. EMN: The game’s more expensive, it’s probably—I can’t say for sure, and I would hope not—still thought of as a white game. Parents are spending a lot of money to get their kids’ skills advanced. LM: It’s become more and more expensive. It’s a big investment of time and money. EMN: Let’s finish here: Would you say that hockey has become a globalized game? Is there a distinction now between how the Russians, the Swedes, the Finns, Americans or Canadians play? LM: There’s been a breaking down of the differences, of the barriers, because of more and more international competitions, easier travel. There’s been greater intermingling of different players from different nations. That has contributed to more of a homogenization of the way the games are played. You still have bigger ice surfaces in Europe. But then you see here, fighting is dwindling, so we’re getting more like the Europeans that way. They’ve gotten rougher and tougher in the way they play. We’ve met them somewhere in the middle. EMN: I’m of the mind that the NHL game is in a very good place. Since the [latest] lockout, with the rules changes they made then—getting rid of the two-line pass rule, and for the most part, the trap—I think it’s been a really entertaining game since then. LM: I would add to that. I think the two-line pass rule was overdue [to be removed]. I don’t think that teams take advantage of it as much as they could, with long outlet passes. The games also got quicker. The times between whistles were cut back. Allowing the two-line pass meant less stoppages in play. There’s now often five minutes without a whistle. Goal scoring is way down. That takes away a little bit. The Oilers used to average 5, 6 goals a game. It was amazing. The quality of players is no worse, across the board, than it used to be. With better goaltenders, and big goaltenders that occupy three-quarters of the net, it’s become too difficult to score. That’s one problem they should look at. EMN: You pretty much always have to tuck it in the top corner now, it seems. LM: Or you see a lot of shots from the point, and the goal goes in off a lucky bounce. So many are scored off cheap, lucky deflections. That’s too bad too. You want skill to win, not lucky bounces. EMN: Maybe they’ll make the net bigger. LM: There’s not been much talk about that. That would be dramatic; it’s been standardized for so long. You know, in basketball they brought in the 3-point line, which really revolutionized that game and was a fantastic change because it meant teams could catch up quickly. We’ve made some changes to hockey, but we haven’t been able to take care of the scoring problem. June 13, 2015 in Blog posts, Interviews.